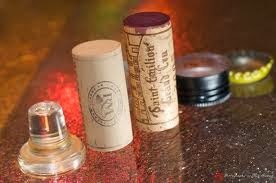 WineWalkabout: Cap, Cork or Glass Closures? You Choose! So recently while selecting something untried to drink, an Italian Sangiovese it was, with the point being to try to expand our drinking selections. When the bottle arrived I exclaimed “oh! It has a screw cap” (ok brilliant observation, right). At this moment Kiwi says “I wasn't aware you were a closure snob”. Well as it turns out I am only a little bit of a closure snob because I do generally prefer the natural cork (hopeless romantic) over any other means of sealing wine into a wine bottle, although screw caps can be so darned convenient. To prove a point, just the other night I had by choice, a Justin Vineyards bottle of Orphan which has a screw cap, with no hesitation or trepidation. If that is not enough proof, I am also very fond of Penfolds Bin 389 Cabernet / Shiraz, which is also sporting a screw cap (as do a bunch of my favorite Aussie and Kiwi wines), so there! But all this leads us to the question at hand, “what is the best closure for wine?” This has been an ongoing industry and consumer discussion for a while and we don’t think it will be solved during this discussion or anytime soon, as it has a number of complexities, most of which only science and the market will settle, but here are some of our ideas (oh come on you didn't think we were going to leave without giving you our two bobs worth did you?). Look here are some simple thoughts (don’t go there). The natural cork has history and it gives ceremony to the opening of a bottle of wine. It makes you wait just a little longer giving you time to think and anticipate the coming delight. Cork is a natural, renewable, recyclable and biodegradable material that is generally obtained through an environmentally friendly harvesting process where the trees are not cut down to harvest cork, rather the bark is hand harvested every nine years. Cork oak trees can live up to 200 years. Totally sustainable! It also comes with a 1% (That's a cork industry percentage) possibility that it could ruin a good bottle of wine. We have been told by those in the wine industry and with some personal experience that it is probably closer to 3-5% and we would mostly agree with that but think it could be as high as 5-8%. The cork grade quality has a huge influence on this number. Now the same opening scenario can be said for the synthetic cork except it is made from petrochemicals, is generally not biodegradable and historically rarely recycled. They are not sourced from a sustainable product. The long term seal of the artificial corks has also historically been poor, so long term aging is potentially perilous. The current versions have evolved to a point where the seal issue seems to be no longer a problem. One of the leaders in the synthetic cork manufacturers is Nomacork. They seem to be on to something. They have improved the manufacturing process whereby 100% of the waste is recycled in one way or another and a variety of other manufacturing advances that improve not only the closure performance but also its use of water and raw materials. With the newer processes a wine maker can even pick their own amount of O2 transmission. Now screw caps are very convenient. You don’t need any special tools to open, and they are not susceptible to tainting the wine. The latest testing indicates it’s also the most stable capping method for the consistent maturing of wine although very very slow. Now there are some options for the screw cap closure that do have a slight influence over the wines ageing process. This may or may not be of much importance as winemakers disagree on the importance of O2 transmission through closures. But Screw caps are not made from a sustainable product either and they are not biodegradable. They do have an advantage of generally being a little less expensive. They are also being made from recycled aluminium. Now one of the newer kid's on the block (2002) is making some waves. PROCORK, having all the advantages of cork with out the issues according to the literature and according to those who have adopted it. The first production was done in 2002 in the Yarra Valley on the edge of Melbourne, Victoria Australia and was then shifted to Barossa Valley and even Coonawarra South Australia. The sales pitch is all about a thin 5 layer membrane technology. Applied to cork it prevents cork taint, TCA and other taint compounds from entering the wine. This 5 layer coating is claimed to allow the optimum amount of oxygen into the wine, so that the wine can develop in a consistent, natural way. There are a lot of top notch folks who have adopted this closure giving it a growing foothold in the industry. One of the newest kid's on the block is the new Alcoa Vino-Seal glass closure. With a design similar to a decorative decanter stopper, Vino-Seal was developed as an alternative to traditional wine stoppers. Vino-Seal or Vino-lok uses an inert o-ring to provide a sterile seal as its way of preventing contamination or oxidation and it is recyclable. In a one-year independent test recently conducted by scientists and wine experts from the prestigious Geisenheim Institute for Applied Enological Sciences and the Oppenheim/Rheinhessen State Teaching and Testing Institute indicates that Alcoa CSI's Vino-Lok closure system meets parameters for technical as well as taste performance compared to traditional wine closures. We will see how this shapes up over time. So what is the decision? Well that's a good question that as it turns out really as best we can tell has no clear winner. Even the quality of the bottle can affect the seal of the closure just to add another risk to the seal. What we did find is that everyone has an opinion, and that the science is mostly science and does not quantify the positive effects on the wine only O2 transmission or specific chemical problems like taint. We have not experienced the Vino-Lok yet, we haven't been fans of plastic corks in the past but more recent experiences have been fine. We do tend to favor natural, and coated corks, but our buying and drinking habits are not affected if its a reconstructed cork or screw cap. 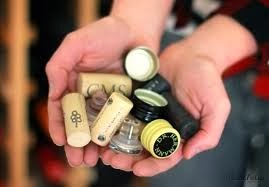 Unless we are are derailed by a tainted cork we don't much care, even when it’s a surprise! No you shut it, no you shut it, no you shut it! This is an update on this blog with an article that speaks specifically to this issue. issues and will now bottle its entire product range under cork." I work at a very well known winery in Australia, and over the years have found TCA levels to be around 7-8%. This is however, only one of the faults caused by cork. Oxidation is a huge issue, that a lot of consumers do not even consider. As a winemaker, our aim is to give our customers the best experience possible when they open a bottle of our wine. 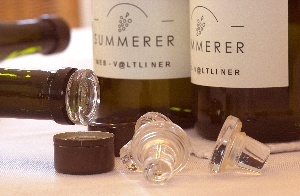 If a customer opens a bottle of 10 year old Riesling, it appears brown in the glass, but is not "corked", the consumer will often assume that it is a bad wine. This may be the case, however, if you have this same wine under screw cap, the wine appears a beautiful golden yellow. This can only be put down to one thing- The closure. Cork, being a natural product, allows different levels of oxygen to pass through and into the wine. Screw caps allow a "controlled" amount of oxygen ingress, which allows each bottle of wine to mature at the same rate. That way, when the consumer opens a bottle of wine, it will appear as the winemaker would have intended. Thanks for you first hand observations.